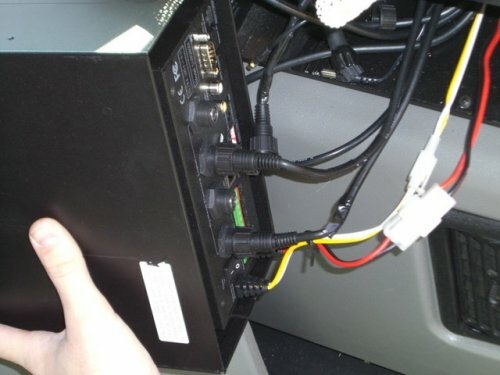 In this photo you can see they also secured the power wires to the propriety camera cable connections causing several to fail and pull out of the DVR. We were contracted by ATX many years ago to clean up another dealers installation when more than half of the customer systems were reported as inoperative by the customer. The units were the early product versions fitted with the large hard drives for storage that offered massive storage capacity at the cost of reliability. Aside from mounting the units on their side, something not recommended for fragile hard drive based DVRs, the installer failed to secure the lock box properly and when the fragile mounting system failed it permitted the lock box and DVR to smack back and forth with every acceleration and braking inertia, with a full 4" swing span permitting more than enough G force to destroy almost every hard drive mounted in this fashion in short time. The failure experienced in this customers systems were the result of inept and incompetent installation.